of conscience into a living experience in the ascending values of cosmic reality." The Urantia Book was first published in 1955. 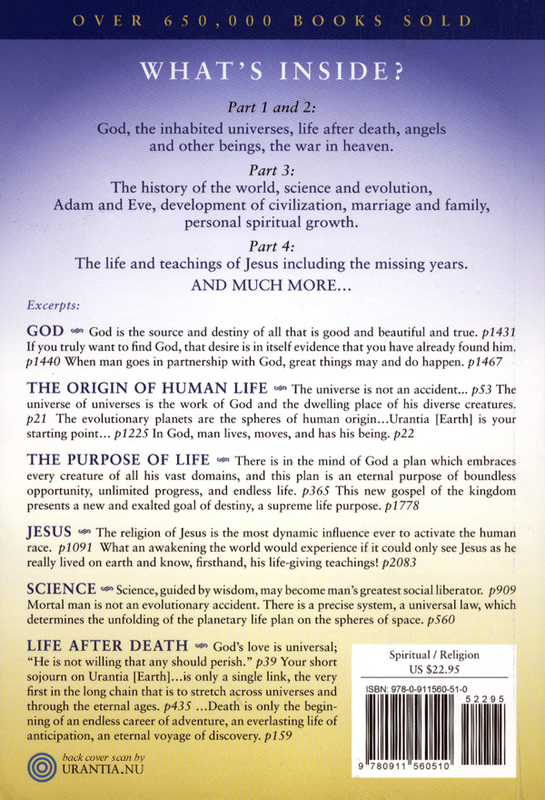 It is a 2,097 page complex meta-physical tome that, on the surface level, appears to offer an explanation about all of science, religion, and history; a history of mankind, of the planet, of the entire universe — how all of the seen and unseen agents of God were created; how they are organized and function and their roles; and how and why we were created. It is a Cosmic Oddysey of mankind's Ultimate Destiny and Purpose. It corrects every problem with society and with religion. It's not Christian, yet it's also the most pure form of Christianity that there is. It can't be described because there is nothing else like it. If you let it do the work it was designed to do, reading The Urantia Book will heal your mind, your heart, your soul; and raise your vibration to another level. "Introductions to the Urantia Book" section of the links page.